In yesterday’s post I discussed the christening of a new era at Carven, in the hands of two ingenues: Alexis Martial and Adrien Caillaudaud. Elsewhere at Nina Ricci, former artistic director of Carven, Guillaume Henry commenced his reign. 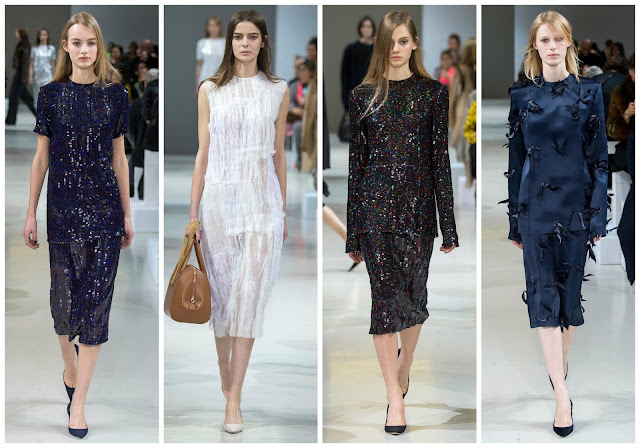 Filling the big shoes of Peter Copping, Henry had something interesting to say at Nina Ricci but it did feel distinctly different to last season. Consistency thrown out the window, Henry lent his virtuosic ways to the brand. There were no floaty shapes to be seen. Everything was cut cleanly precisely. Top model Julia Nobis opened the show in a black coat with a white top underneath. Her lace skirt was an indication that there would be a sensuality to the collection. Julia Bergshoeff’s navy lace dress was ruched, and sheer. Slinky silk numbers, present in this collection, are perfect for a winter’s eve. Henry’s interesting spin on classic garments were intriguing to say the least. There was matted goat furs. Classic coats with copious amounts of fringing. Fringing erupting from the sleeve of a coat. Tweed with rough edges. Varnished double-breasted jacquard coats. Delicate lace looked like it had been reduced to a shadow of itself at the sands of sandpaper, creating a rough effect. I liked that. Coats were compartmentalised, as were dresses, in what looked like patchwork techniques. Surface decoration was key in creating this look. A cropped camel jacket paired with matching wide-leg trousers. Camel was one of the few colours in Henry’s palette. Navy, cream, white and black were about as far as the collection reached, with the exception of a red sequinned dress. A sharply tailored, olive overcoat was styled with a blush-coloured lace t-shirt and skirt combo. Though some have been quick to call it beige, I liked this collection. I wasn’t exactly smitten. It wasn’t the most exciting collection bar Waleska Gorczevski’s shimmering silver dress, Mica Arganaraz’s sparkling ruby red dress and Hollie-May Saker’s patchwork number. It is a collection that will provide many winter staples in a woman’s wardrobe and I have to admire that. There were some covetable pieces. However, it was a little too bland.